I didnt' trim the blanches of lantana plant till early spring, which delayed the blossom this year. So I was happy to see these small orange flowers blooming the other day. It's turning pink now. ended up playing with some images that I took a while ago in a RAW format. It's a function under "image overlay"
New creations & a few earrings that went overseas. This bracelet was custom made for the customer at The Hearth Shop in Carmel. Working on these custom made jewelry with small herkimer diamond quartz. 1. Multi Strand Mixed Stone Oxidized Sterling Silver Link Necklace - knotted amethyst, amber, aventurine, amazonite, chalcedony, carnelian, rose quartz, blue lace agate, iolite, garnet, prehnite, coral, lapis lazuli, mother of pearl with ruby & turquoise at the end of the extender. Full of spiritual energies in this one-of-a-kind statement piece! Very simple and casual bracelet, great for everyday wear. Would you choose labradorite, the stone of magic, or moonstone, the calming stone? This red tumbler has been working very hard lately after being fully fixed! 1. Bracelet is accented with gold pyrite for a whimsical contrast. Pyrite is a stone of luck, wealth and success, had been mistaken as gold, known as "Fool's Gold". Shiny version with no pyrite makes quite a different look. 2. Made another ruby necklace. Joined by other colorful stones, ruby stands out as a stone of vitality. It is also 15th & 40th aniversary stone. 3. 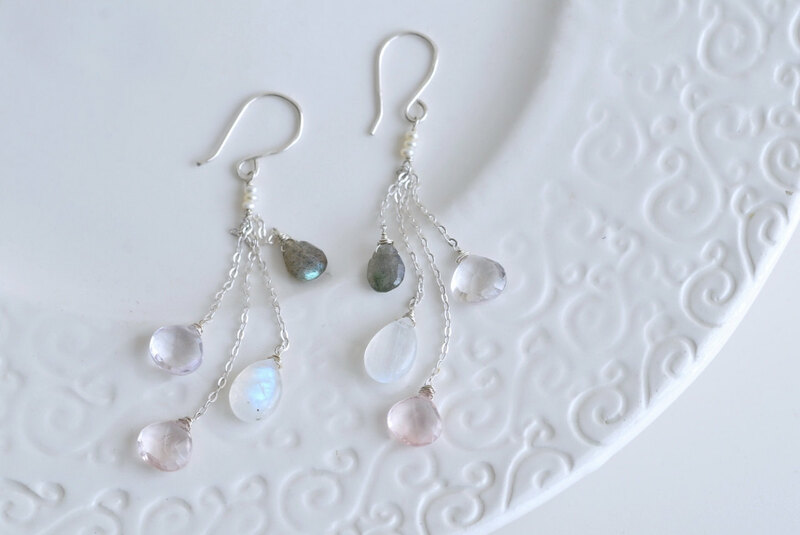 Pastel toned multi color sapphire droplets add a romantic feminine look to the links. Sapphire is great for artists, also represents joy, peace and beauty. It is 5th & 45th anniversary stone. Oxidized version would bring a unique rustic feel. Today was gloomy and chilly all day long so I dropped by my favorite cafe at night to have this yummy strawberry croissant and a cup of hot latte, which uplifted my mood nicely! To celebrate upcoming Mother's Day, 20% Off all orders. Enter "MOM20" upon the checkout. The long cascade earrings at the end were custom made for a bride. Many new designs are also being released throughout the month so stay connected!